Say you were making 24 interior doors 7'8" tall, 1 3/4" thick, sapele. 8/4 doesn't work, too thin. Which would you do? I use 8/4 to make 1 3/4" doors. Why doesn't it work? To wavy? Stave core is the way to go for stability if you can manage to make or get them for a reasonable price. One or two doors it's probably going to be to expensive. But then again, a failed door is pretty expensive all by itself. We recently used Carolina Engineered Wood Components to supply engineered stiles for a large interior door job and were happy with the product, and felt they were quite reasonable. The staff is very knowledgeable and flexible, as well - willing to tailor the product for special requirements. I don't think there is any question that an engineered product of this sort is superior to a solid stile. As Leo mentioned if you were going to make a smaller number(4 or less) it would be reasonable to laminate. You might make more money by outsourcing. That is a fair amount of milling(72 sticks for every part) and gluing. I think first you have to ask your self why is the client hiring me . I have not done only because in are area no one willing to pay .We do a far amount of exterior doors I have none that have warped . Read David post on doors there more information than most books . Laminated refers to 3 pieces of timber glued together to achieve a stable thicker timber. (24) doors x 3 pieces = 72 pieces of wood for every part(stiles & bot/lock/top rails). That is a ton of milling gluing & sapele. Laminated core typically refers to a lower quality of the same or less costly species of wood laminated together then thick veneered. Engineered core refers to lvl or parallam door specific(not the stuff from the lumber yard) which is then thick veneered. I would go with a engineered core for your project. Based upon number of doors, species of wood, and height of the doors. To me, the inappropriately named "engineered core" (there is no engineering involved in the process whatsoever) is an assembly of solid wood rips glued to make up the stiles in width (not thickness). This assembly will have exposed hardwood edges that will show after the face laminations are applied. The core parts might be quartered, flat or indeterminate, as oriented to the face. If you have a good lumber source, 8/4 in the rough should easily make your 1-3/4" product. S2S will be too thin to joint and still get the thickness you need. I have never used 10/4 to make a 1-3/4" door. Which is cheaper? Labor or wood? Cored stiles (and rails and panels?) will have 2-3 times the labor in each part. Solid stiles are much faster. 8 hrs for a simple door in solids, vs 20 hrs for assembled stiles and rails. Our labor is based upon the idea that the trees are growing, and there are more today than yesterday. But our time is gone once it is gone. So time is more valuable to us, and we will make from solids whenever possible. Out of thousands of interior doors with solid stiles, I have had 3 warp enough to warrant replacement. Two had wet wood, and one was reaction wood. When I'm doing solid stiles I process them slowly. Flatten one side and plane it and let it sit over night to see what it does. Do that again and again until you get to the proper thickness. See if it's stable before you put the door together. Hard to do if you got a ton of doors to make. But if it's one or two then you don't ever have to worry about movement. One more thing about solid doors vs most other methods. The door craft for about 100 years or more crowned the latch stile to hold the latch in tension when closed. This gave a better seal and prevented rattles. A good shop will still do this today if they pre-hang. If they don't, they may still mark the door for a crown so the carpenter that is hanging the door will know which face goes where. Try to get your outsourced materials with a 3/16" crown in half the stiles. Or, try to do it when you are laminating for thickness, veneers or whatever. But, in solids, it is relatively easy to do at the joiner. Then, in a few months when you visit the job for some photos, you can point out this detail to the owners and the builder and show them how the door snaps shut, while being tight top and bottom. Most people that make a living from making doors today know nothing of this simple point of craft. It makes me wonder what else has been lost as one 'method' supplants another. No need to through mortise. A deep blind mortise is more than enough. Back in the day they would do a mortise and then pin the door, and they are still together today. I feel that a through mortise just allows moisture to get inside the door easier. The thru mortise with wedges is a UK method. The stopped mortise with pins is a US method. Those methods are all dry. No glue. Some reproduction shops still do it and glue. More of an aesthetic. Our threshold's are also the opposite. As well as riser/tread fastening in stairs. I agree in general with your comments about solid vs not-engineered. In the original posters case. I thought it would be more economical for him to outsource these to a shop that is tooled up for not-engineered work. He's effectively outsourced a large chunk of risk and created a fixed price as part of his overall estimate. I've never bought 8/4 sapele. No idea on cost, or stability. I love the look and workability. Through wedged tenons were used in the US also. 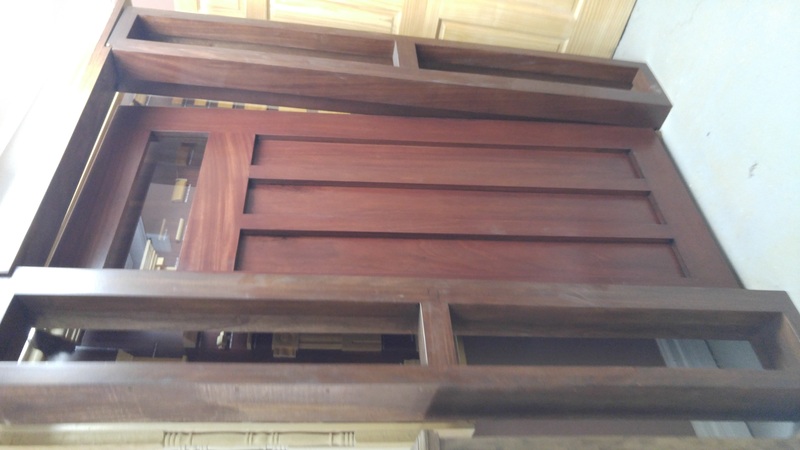 A lot of mass produced doors were made this way in the late 1800s and early 1900s. With a chain mortiser it is quick. I would never intentionally build a crown into a stile. I find that whatever method we build with- solid, stave core or laminated there is always a slight crown. Always good practice to crown your stiles, even on cabinet doors. Save yourself a lot of frustration and outsource some "non-engineered" engineered components. Works awesome for us mere mortals (hacks to some), you'll have straight doors, consistent faces, and you can make some money. It works and is preferred for 99.9% of door manufactures across all market segments, it'll surely work for you. And just to ease your mind a little on the use of "non solid" components, it has been a staple of door building for easily over a century. We no longer make doors because we can buy nicely made doors cheaper than we can make them. We have rarely done residential work, so when we made doors they were always to some specification. Where architectural match was required they were always veneer staved. Other wise it depended on the finish but mostly solid because it is cheaper by far. 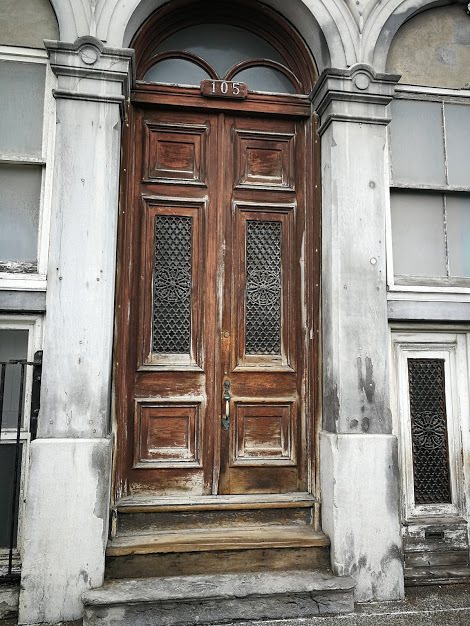 Exterior doors were always stave, with back to back panels and a plastic separator, because of our extreme climate. Thank you for all the informed responses, I appreciate it. I think part of it depends on the wood and I'm not sure I'd consider sapele all that stable? I've only used it once and found it moved all over the place, so personally I wouldn't use solid for a tall door like that. I've made a bunch of doors from solid with good results, and then for a short while tried the 3 piece glue up. These days most of my doors are stave core but I'm making the cores. I use the same material for the cores as the faces, just re-saw all my skins from the best stock and mill the remainder into strips to glue up the cores. Mill those flat and then glue on the skins. A LOT more work than just making out of solid, but they are stable as heck. just my opinions though, good luck! Sapelle, slip tenons and West epoxy. This double door (8' x 6') was made the 'old fashioned way' on a shaper with a rub bearing and patterns. 'Rails' (includes circles) are made of 1/2" sapelle laminated to OSB core (engineered core). THIS door has sticking, so the only 'edge' glue-one I needed was along the long edges (I leave the tops and bottoms as open core, can't see them and it helps door 'move' with temp and humidity changes. I DO seal the hell out of them though!) but you can edge all pieces if you are doing integral sticking. The door is finished with a mixture of tung nut oil (imported from China, the ONLY supplier of this oil that I know of) and orange solvent (you can use any solvent, the orange just smells a lot better!). I give it al least 4-5 coats (I also coat 'components' once glued up, so that the finish is on all sides of component) and allow each to dry for a day or two. You can also mix aniline dyes into the mix to 'stain' the wood. I developed this finish for use on doors, windows and shutters in St Croix, and was the best finish we ever used. 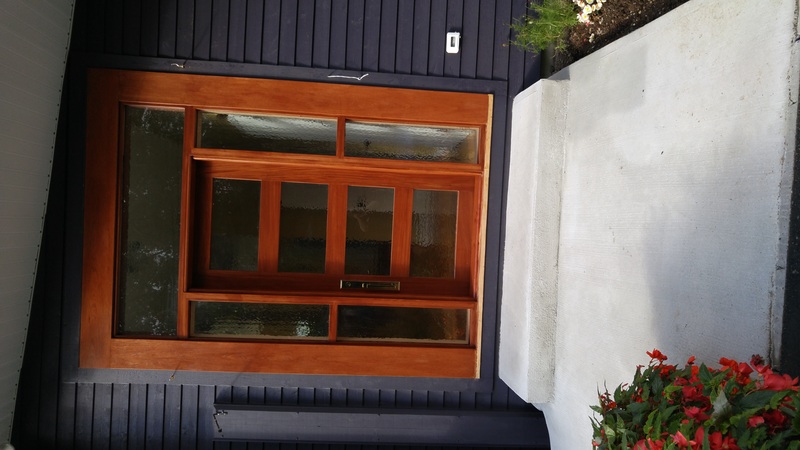 The best part is that in a year or two, you can bring a small mixed can of oil, a rag and a plastic drop cloth, and refinish the door in front of the client as you talk with them about new projects! Most homeowners are thrilled when they learn how easy and foolproof it is to 'refinish' their doors too! 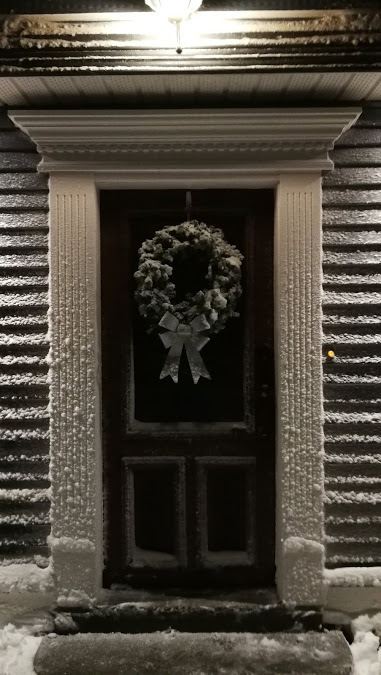 This door is located in Stamford Ct. it's seen more than 10 seasons, on a sounteast exposure, in northeast winters. It looks exactly like this to this day, hasn't moved a fraction of an inch (still 'click closes') and it's been 'refinished' twice. While I was building this door, in a rented space in a shop, I got hired to design and build 42 white oak doors for a private residence in NYC. 4 of them were either 'spring line' tops or barrel tops. We did them all as pre-hung, in white oak frames. From the time we got the rails and stiles in, it took just under 3 months to build, finish and install all the doors.